If there’s the ultimate couple goals in the whole Disney-Pixar universe, it would be Carl and Ellie without a doubt. Ellie’s wild imagination and Carl’s quiet personality may be totally different, but they do say opposites attract. It isn’t surprising at all that these two playmates became lifelong partners. Pixar created a truly wonderful love story in under ten minutes. For this set, Carl and Ellie are wearing their childhood outfits. Ellie has on a floral blouse and denim overalls while Carl prefers a white shirt under a brown vest and cute khaki shorts. Here’s everything you need to look like Carl and Ellie. 1 White Polo Shirt Carl’s personality is reserved and a pristine white shirt symbolizes this perfectly. 2 Brown Sweater Vest Wear a brown sweater vest atop your white shirt for a more conservative Carl look. 3 Khaki Shorts To balance Carl’s more mature outfit, he matches it with a cute pair of khaki shorts. 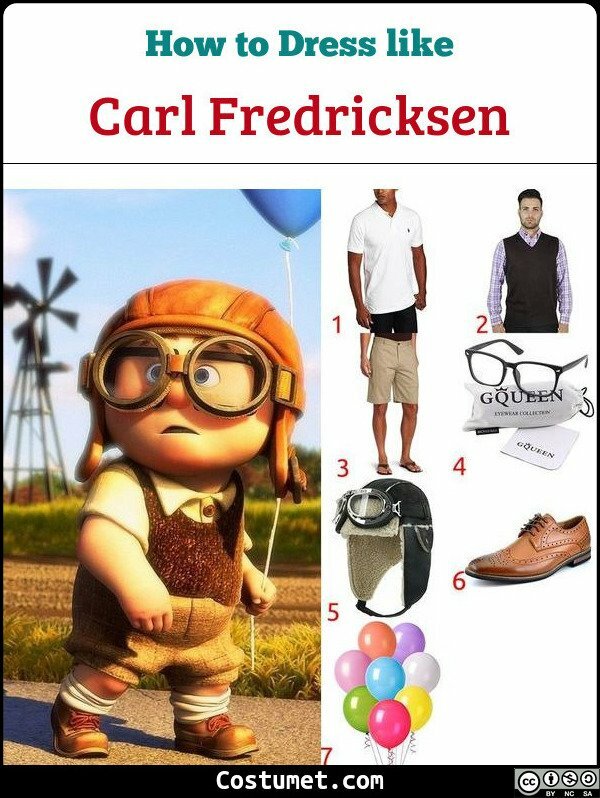 4 Black-Rimmed Glasses To see his adventures more clearly, Carl wears a pair of black-rimmed glasses. 5 Aviator Hat The mark of their similar interest, Carl wears an aviator hat because he’s also an explorer like Ellie. 6 Brown Oxfords A clean look isn’t complete without a pair of classic black Oxfords. 7 Balloons Carl loves balloons and he became a balloon vendor when he grew up. 1 Floral Blouse She may not be the quintessential cute little girl, but Ellie still looks quite feminine with her floral blouse. 2 Denim Overall Shorts Practical and cute, Ellie’s casual denim overall shorts look innocent and stylish. 3 Red Retro Headband Add a little red retro headband to show Ellie and Carl’s time period. 4 Our Adventure Book To store all your memories. 5 Black Tooth Fx To imitate a broken tooth as Ellie, paint it black. 6 Soda Bottle Cap Pins Pin them as badge of honor on your overall. 7 Aviator Hat As president of her adventure club, Ellie also needs an aviator hat. Ellie’s name was inspired by her voice actor Elie Docter who is incidentally the daughter of Up’s director. Carl is voiced by talented actor Ed Asner. Barbie costume is wearing a turquoise unitard with a thick, hot pink belt, rainbow leg warmers, and a hot pink pair of heels. Ken costume is light blue shirt, ascot & shorts. Woody looks like a vintage sheriff through and through (except he wears brighter colors). He has on a yellow long-sleeved top, denim pants, cowboy boots, a cowboy hat, and his shiny sheriff badge.